1) slide the letter into the track from the end of the track set (sometimes the letters may "hang-up" due to variations in the track spacing or very slight letter orientation changes). This ease of movement in the track could allow letters to "walk" in front of one another in the track. 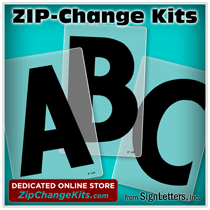 The kits shown here will provide enough standard replacement characters for general messages to your customers, church family or by-passing motorists. Using our letter set for portable sign systems will give you enough flexible sign letters to spell entire words, instead of attempting to make-up abbreviations or chop-up (we meant to say customize) letters to make others.